When you join Glenrath Farms you will become part of the Campbell family. We are a family business with family values. Our values have been developed into our farming operations. At Glenrath Farms you can choose from an array of jobs that offer you opportunity to develop your career. You can look forward to working with a dedicated team that aim to produce, market, sell and distribute high quality eggs. Please download and complete this PDF Application Form and then email it back to us. Our application form requires a suitable PDF viewer. Not all PDF viewers will be able to display the form fields. We recommend Adobe Reader which is a free download. At Glenrath we collect, grade and deliver over million eggs a day to retailers across the UK. We also have to transport the eggs from the farms to the packing centre therefore logistics is a very important aspect of the business. We would provide training on how our logistics department works. Any experience within the logistic environment would be an advantage. At Glenrath the packing station team are essential in ensuring good quality eggs are delivered to our customers. You will be working with state of art machinery. 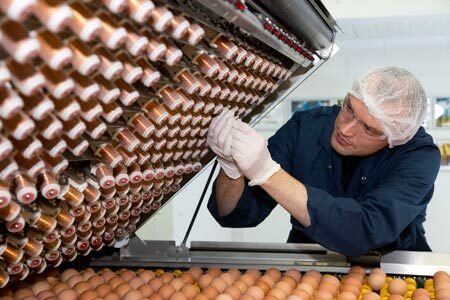 Within the packing station there are many jobs from packing eggs, dispatching the eggs, quality control, forklift drivers and cleaners. Our management team will help you find your way in our fast pace working environment. The production team are committed and determined to meet the Glenrath goals. We look for people who have drive and energy. It is a 24/7 operation therefore flexibility and ability to work shifts is key. At Glenrath Farms the administration team are essential in making sure operations run smoothly. You will be working with leading food retailers which mean it is essential that our team are responsive, dedicated and friendly. Within Glenrath Farms the administration team are open to an array of jobs from Accounts and Finance, Account Managers, Human Resources, Procurement and Business Analyst all of which require basic IT skills. At Glenrath we have invested in state of the art machinery to help insure we deliver a high quality product to our consumers. We are looking for people who will take a pro-active approach. You will be working alongside our Production team to solve any problems. The ability to communicate and listen and learn will be essential. We will ensure you are provided with training and development support to allow you to progress your career. We recruit qualified, multi skilled and experienced engineers in a number of roles which require different levels of experience. Glenrath is a 24/7 operation as livestock need attention every day. Flexibility and willingness to work shifts will be key. At Glenrath, hens are our business. With over one million hens we need a team of dedicated staff who will concentrate on the health and welfare of the birds. Working with livestock provides great job satisfaction – the reward is healthy productive chickens. Attention to detail is vital when working with livestock. We are looking for people who are willing to work within a motivated team. Training will be provided on the job.